M T D J u n e 2 0 1 8 10 N e w s / V i e w s Ford honors Pirelli Pirelli & Cie SpA has received Ford Motor Co.'s Gold World Excellence Award for its performance as a global supplier. Only 88 companies were selected as finalists from thousands of suppliers. Pirelli was also a finalist globally for Ford's Brand Pillar Award. Network funds visit Members of the Automotive Distribution Network donated $2,500 to help Dream Fac- tory of Memphis provide a trip to Disney's Magic Kingdom for a critically ill child. Michelin wins supplier honors Vulcan Materials Co., a producer of ag- gregates and other construction materials, has honored Michelin North America Inc. with a gold-level supplier award for off- road tires and a platinum-level award for on-road tires. Counterfeit labels found Counterfeit lift inspection labels bearing the Automotive Lift Institute Inc.'s (ALI) Certi- fied Lift Inspector mark have been found in New York City and Long Island. ALI says the counterfeit labels go back to at least 2016. Record attendance expected Organizers of the 16th China International Tire Expo (CITEXPO) expect more than 15,000 industry professionals, a record, to be at the Shanghai World Expo Exhibition & Convention Centre Aug. 20-22, 2018. ATD names general counsel American Tire Distributors Inc. (ATD) has named Gail Sharps Myers as general coun- sel, chief compliance officer and secretary. She succeeds J. Michael Gaither, who is retiring. Truck tires are recalled Continental Tire the Americas LLC is recall- ing some Conti Hybrid HS3 tires in size 11R22.5 load range G because the cords may be visible through the innerliner. Nexen has a new website Nexen Tire America Inc. has launched a new website. Features include a rede- signed dealer locator; an improved tire finder; and interactive product information for consumers. 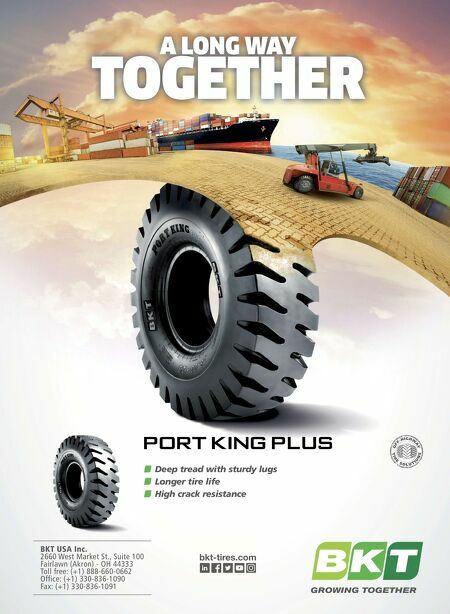 Bites U.S. AutoForce buys Tire's Warehouse TBC adds 8 NTB and Tire Kingdom stores, plans 20 more T he landscape for U.S. tire distribution continues to change, as two more compa- nies are combining forces. U.S. AutoForce (USAF) has acquired Tire's Warehouse Inc. (TWI) as of June 1, 2018. U.S. AutoForce is a division of U.S. Venture Inc., and the company says as part of a "unique strategy," it will retain the Tire's Warehouse name, company structure, employees and ways of business for the foreseeable future. "We are excited by the opportunity to combine the TWI and USAF families," says Pat Hietpas, president of U.S. AutoForce. "eir expansion up and down the West Coast is impressive, and their reputation for outstanding customer service and strong company culture falls directly in line with both our business strategy and values. We're confident this venture will give our customers an even bigger competitive edge." TWI was established in 1969 by the Helmle family. e company announced it will open a new distribution center in Fresno, Calif., in July. e 122,000-square-foot facility will bridge the gap between TWI's Southern and Northern California branches. It will be the company's eighth warehouse, three of which have opened within the last three years, and brings its total distribution center square footage to over 700,000. e new Fresno distribution center will service California's Central Valley, which is TWI's largest geographical service region to date. It will carry a full lineup of brands and products for consumer, commercial, industrial, farm and trailer applications. "Aer more than 50 years of business and continued growth, Tire's Warehouse is extremely proud of the level of service our customers have come to expect from us," says Dan King, president of TWI. "is acquisition will give us access to new resources, brands and channels and our valued dealer network will only experience the positive effects of this transition. We plan to not only maintain those expectations, but build on them further." U.S. Venture also has remained family-owned since its inception in 1951, and the company is one of the largest, privately held companies in Wisconsin. U.S. Venture distributes petroleum and renewable energy products, lubricants, and tires and parts for the automotive aermarket. e merger is the latest twist in tire distribution in the U.S. this year. First it was the joint venture between Michelin North America Inc. and Sumitomo Corporation of Americas. Next came TireHub LLC, the combination of distribution systems for Goodyear Tire & Rubber Co. and Bridgestone Americas Inc. S ince the start of 2018, TBC Corp. has opened eight NTB Tire and Service Centers and Tire Kingdom stores. e company plans to open an- other 20 locations by April 1, 2019, in both new and existing markets. " 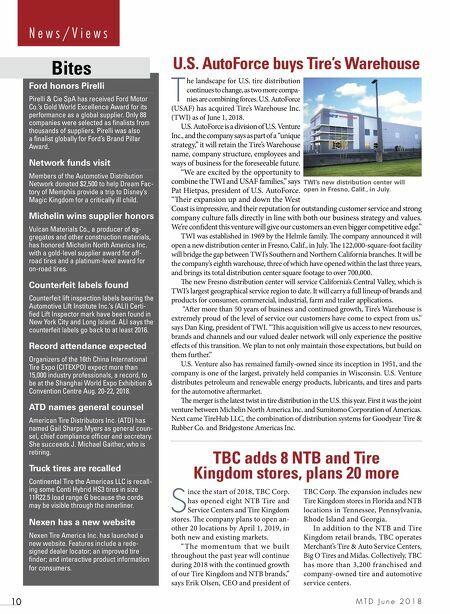 The momentum t hat we built throughout the past year will continue during 2018 with the continued growth of our Tire Kingdom and NTB brands," says Erik Olsen, CEO and president of TBC Corp. e expansion includes new Tire Kingdom stores in Florida and NTB locations in Tennessee, Pennsylvania, Rhode Island and Georgia. In addition to the NTB and Tire Kingdom retail brands, TBC operates Merchant's Tire & Auto Service Centers, Big O Tires and Midas. Collectively, TBC has more than 3,200 franchised and company-owned tire and automotive service centers. TWI's new distribution center will open in Fresno, Calif., in July.